The pear tree out back by the garage on Circle Road was not a summer pear tree. This was a twisted moss covered old lady who gave up her fruits in early autumn and her back was breaking under the weight. When the fruit got to a certain size, my mother would wrap some still green fruits in newspaper and place them in the potato drawer to ripen. A child could use her heft to pull open that drawer on a rainy afternoon and discover nice packets of clean yellow juicy fruit if she was lucky. What a windfall to find one of those packets. Oh how I loved those pears and that tree. In Lyon right now, there's a pear local to the region that has got quite a reputation herself. When I was researching local products along the Rhone river going South not too long ago, I came across the name of a certain producer of a summer fruit, precocious and fragile, called the Poire William. This fruit has always caught my eye at the market in early summer, first because it comes from local production, and second because it packs a powerful flavor punch, with a musky come hither kind of perfume and lots of juice, even if the fruit shows every nick and scratch and won't last long in the fruit bowl. These pears actually were cultivated and enjoyed great popularity in the region starting in the mid 1800s, mainly as table fruit, i.e. fresh fruit for eating plain, and reputed for their deliciousness. A hundred years down the line, given a relatively short shelf life and easy bruising, conditions during World War II had cut off logistical channels and tanked the economy in and around Lyon. One enterprising fruit grower by the name of Colombier in Vienne, 20 miles south of Lyon, came up with a way to get something from his leftover fruit. Over three years during the 1940s, he experimented in his atelier and perfected a new technique for distilling eau-de-vie from his summer harvest of Poire William. Chef Fernand Point, our consummate original locavore, took a keen liking to the perfected product, and they struck up a deal on M. Colombier's eau-de-vie Poire William. Although a very small quantity of the precious nectar was distributed to the cultivator's restaurateur friends in Lyon, on the whole, his production went exclusively to La Pyramide. M. Colombier's method remained a secret up until the late 1950s, when suddenly recipes and technique spread like wildfire through the region and eastward as well, resulting in that lovely Alpine deliciousness we sip from little glasses at red checkered tables in the Alps called Williamine, a close cousin, a God daughter for sure, and a probable direct descendent of M. Colombier's product. On the wave of an economic boom, commercial production of this product exploded. Since then, many of these operations have closed, leaving 6 producers of eau-de-vie Poire William using local fruits in the region today. Two things about the fruit we call Poire William - the table fruits and the fruits destined for the distillery are treated quite differently even from conception. While our table fruit is ripened on a tree that's original all the way down, the fruit for juice now comes from trees that have been grafted onto the roots of another tree altogether, done to maximize flavor. For the nectar, they are also picked early, in order to capture certain flavors that tree ripened mature fruits don't transmit well through distillation. I serve eau-de-vie Poire William at the end of the meal as a digestif, in little crystal goblets, once we've moved away from the table. Sometimes, when I have a certain supply, I add it to champagne or even mix with ice cold pear juice (double whammy of pear deliciousness) at the apero hour. You can also use it to flavor creams and pastries, flans, etc. and one local ice cream manufacturer in Lyon has mastered a sublime eau-de-vie Poire William sorbet (that would be Nardonne..). As for the fruits themselves, we like to eat a whole fruit plain in early summer. Cool, peeled by hand with a knife at the table. I find that they don't slow cook for preserves well, but they they do bake nicely for example in my Chaource and Pear Apero Tarte, of which I have done many when the Poire William is out. This kind of pear is excellent roasted or a delice simply slow poached in a red wine syrup you can easily mix up on the spot. Very classy, poached pears. Oh I love Poire William! Anything with pears is a class act. Shall never, ever share one again. Your mother's attention to wrapping each pear and squirreling them away is beautiful. 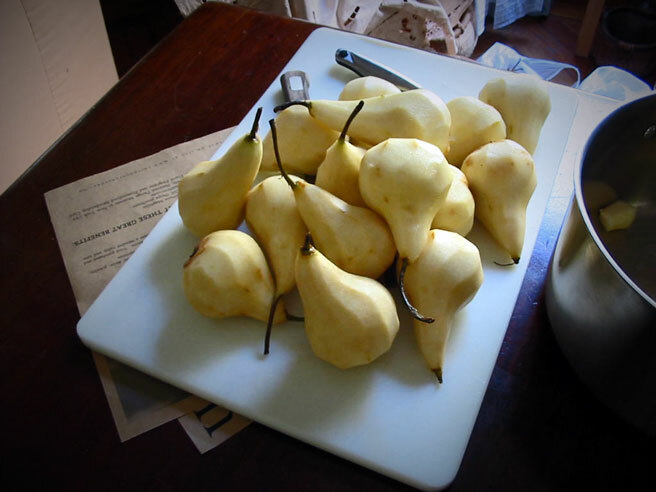 Though my pear are winter fruit I'll be making your Apéro Tarte today. I was looking at your Chaource Apéro Tarte (wow) and got sidetracked to your Parsnip ideas. I was intrigued by the Confit de Panais. Do you have a recipe? We have parsnips growing wild in the vegie patch and I'm experimenting with making the simplest whole chicken liver terrine(without any foie gras). You are right parsnips and liver sound like a wonderful combo. The comice is definitely one of my favorites. So sweet and juicy, not to mention how pretty they are. An autumn pear. A tarte with a Comice pear is prety close to perfection in my opinion. Adding sugar is like gilding the lily. Parsnips are sweet like carrots, even sweeter when you cook them. I will look through for a recipe for you, although the concept is rather simple, slow cooking probably best with duck or goose fat, with the idea of getting a nice caramel going. Good with foie of any kind, I agree. Yes, a nice liver terrine with some caramelized parsnips would be heaven. I love poire William. I make a Pear Souffle and these are perfect becuase of the creamy texture and the strong yet subtile flavor. THank you for all the information about this terasure! Chaource Apéro Tarte! That is one of the most sublime sounding recipes I've seen in a long time. Why have I never noticed it before? I must shamefully admit that I've never tasted Poire William eau-de-vie. It sounds wonderful. Next time I have a chance to taste it, I most definitely will! Lucy, I have been away from your blog for many weeks -- I changed computers and lost my "favorites" for web sites. I have searched you out and read your last several entries. Wonderful stuff. Thank you. I adore pears and when I saw your post I knew it would be wonderful. I must see if I can get some of the eau de vie. By the way, I wanted to say how much I'm enjoying this blog. I only found it the other week but I've loved reading your entries and the pictures are beautiful.